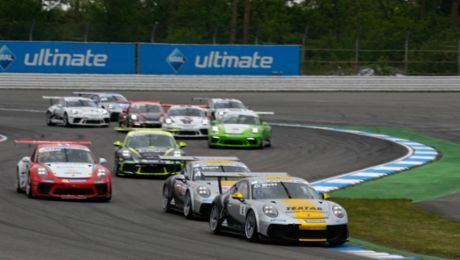 Thomas Preining has concluded the Porsche Carrera Cup Deutschland season perfectly: After the Porsche Junior was crowned champion thanks to his victory at Saturday’s race, Preining followed up with another win at round 14 on Sunday. “Even though I won the title on Saturday, I still really wanted to be first in the final race. Ten race wins in one season is simply fantastic,” said Preining (A/BWT Lechner Racing). Securing ten victories from 14 races, Preining matched the record set by the current Porsche works driver Sven Müller, who claimed the title of the national one-make cup series in 2016. At the Hockenheimring Baden-Württemberg, Michael Ammermüller (D/BWT Lechner Racing) crossed the finish line second. Third place went to Larry ten Voorde (Team Deutsche Post by Project 1) from the Netherlands. Taking up the race from pole position in his Porsche 911 GT3 Cup, Preining refused to give up the lead spot over the entire distance. Just as the racing driver from Linz had built up a one-second advantage on the storied German racetrack, two vehicles collided in the midfield, resulting in the race being interrupted while the racetrack was cleared. After the restart, Ammermüller stuck close to the bumper of Preining’s 911. However, the German driver found no way past the Austrian to secure the lead spot. After 13 laps, 20-year-old Preining swept over the finish line as the winner 0.4 seconds ahead of Ammermüller. For the youngster, this marked his tenth victory in the Porsche Carrera Cup Deutschland. “Thomas Preining was so fast today that there was never really a chance for me to overtake him. After the restart I managed to put on the pressure, but unfortunately the race was over shortly afterwards,” said Ammermüller. Larry ten Voorde was delighted with his sixth podium result. The 21-year-old Project 1 driver took up the race from the seventh grid spot and worked his way up to fourth. In the final lap, he then overtook Dylan Pereira (L/Lechner Racing). “Saturday didn’t really come together for me, so I’m particularly pleased about my podium result at the last race of the season. During the interruption I stayed focussed and my overtaking manoeuvre in the last lap was the reward for this,” stated ten Voorde. Pereira had reason to celebrate after clinching fourth place on the 4.574-kilometre racetrack: With 224 points to his credit, the 21-year-old secured the title in the rookie class. Jaap van Lagen (Förch Racing) from the Netherlands crossed the finish line on fifth place. Sixth place was occupied by the seasoned Porsche specialist Robert Lukas (PL/Förch Racing) ahead of his Polish compatriot Igor Walilko (Raceunion). Toni Wolf (D/Car Collection Motorsport) came eight. The top spot in the amateur class went to Jörn Schmidt-Staade (Cito Pretiosa). The German had already celebrated his title win on Saturday. 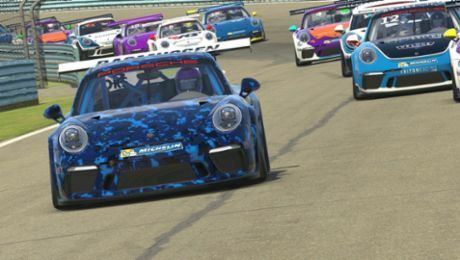 At Sunday’s race, the two guest drivers Matthias Jeserich (D/Team CARTECH Motorsport by Nigrin) and Bertram Hornung (D/Raceunion) claimed positions two and three in this category. The trophies were presented by special guests at the podium ceremony: Dr Frank-Steffen Walliser (Vice President Motorsport and GT Cars), Michael Dreiser (Manager Motorsport One-Make Cups) and Alexander Pollich (Managing Director of Porsche Deutschland GmbH). In addition, three popular Instagram influencers witnessed the final round of the Porsche Carrera Cup Deutschland live. The twins Jan and Jens Weiss operate the account @twins.aesthetics, with “Mister Central Germany 2016/17” Fabian Fröhlich running his Instagram account @fabian_froehlich. Preining took home the championship trophy with 279 points. Ammermüller finished the season as vice champion with 242 points. Third place went to ten Voorde. Over the 14 races, the driver from Boekelo in the Netherlands earned 170 points. The fight for the championship in the Porsche Carrera Cup Deutschland has been decided: Thanks to his ninth win of the season at the Hockenheimring Baden-Württemberg, Thomas Preining claimed the title of the national one-make cup. With 254 points, the Porsche Junior held an unassailable lead. “After my disappointing start to the season at Oschersleben I almost gave up on the championship. Now I’m champion. That makes me incredibly proud. I bet I’m the happiest person in the paddock this weekend,” said Preining, with a wide grin. Behind the youngster, Michael Ammermüller (D/BWT Lechner Racing) achieved second place at Saturday’s race. Sweden’s Gustav Malja (Team Deutsche Post by Project 1) finished third. Right from the start, Preining dominated at the front of the field with his Porsche 911 GT3 Cup. Taking off from pole position, the Linz racer immediately took the inside line and defended himself against Dylan Pereira (L/Lechner Racing). Although Preining initially managed to build a gap to the field, a safety car had to be deployed so that a vehicle could be salvaged. After the restart in the sixth lap, the Lechner driver again pulled clear and crossed the finish line in first place after 16 laps. Behind the young racing driver from Austria, fights for positions ensued. Ammermüller in third put Pereira under pressure and grabbed his chance in the hairpin in lap nine. Larry ten Voorde (NL/Team Deutsche Post by Project 1) also made the most of the situation to get past the Luxembourger. However while doing this, the Project 1 driver touched Pereira’s 911 and received a drive-through penalty. Ammermüller finished on second place three seconds behind Preining. “I had a minor collision in the first corner and at first I didn’t have the speed. It got better during the race, but I couldn’t do better than second place today,” said the 32-year-old Ammermüller. Malja had a special reason to rejoice. The 22-year-old rookie celebrated his first podium result in the Porsche Carrera Cup Deutschland on the 4.574 kilometre circuit. “I started from fifth on the grid and to avoid a crash I didn’t want to risk too much in the hotly contested midfield. This strategy paid off,” said Malja. Fourth place went to Toni Wolf (D/Car Collection Motorsport), with Pereira on fifth ahead of Tim Zimmermann (D/Black Falcon Team TMD Friction). Zaid Ashkanani (MRS GT-Racing) from Kuwait took the chequered flag in seventh. Poland’s Igor Walilko driving for the Raceunion team secured eighth. In addition to the championship title, another trophy was awarded on Saturday: Jörn Schmidt-Staade (Cito Pretiosa) claimed an early title in the amateur class. The German concluded the race second in his class. First place in the race went to Carlos Rivas (Black Falcon Team TMD Friction) from Luxembourg. Occupying the third podium step was guest starter Matthias Jeserich (D/ Team CARTECH Motorsport by Nigrin). Several guests visited the race this weekend: the Vice President Motorsport and GT Cars Dr Frank-Steffen Walliser and Michael Dreiser, the Manager Motorsport One-Make Series. Both gentlemen witnessed round 13 of the national one-make cup firsthand and presented the trophies on the podium. Another guest at Hockenheim was the YouTuber Luca (ConCrafter). The social media producer documented his impressions on his Instagram account @laserluca. The newly-crowned champion Preining sits at the top of the overall standings with 254 points. Ammermüller follows in second with 222 points. The 21-year-old Dutchman ten Voorde ranks third with 154 points. On Sunday, the title for the rookie class is still to be decided. With 199 points to his credit in this category, Pereira holds the best chances. Walilko follows three points behind.